I have purchased a newD-LINK DSL 2730U ADSL Modem + N150 Wireless Router. My interet is working on my computer,but not on my laptop.The wifi light on modem is on,and I pressed WPS and WiFi button too but still my laptop doesn't shows up the connection. I used a beetel modem before,but due to some problems in the modem,it stopped working and so I got a new router. Called up airtel and they visited for a check. Their technician says that there's no Wireless tab in the modem configuration page (which is true). I am not able to upload screenshots as my post count is not>50. What to do? Upload images to imageshack or some such pic hosting site. Provide links by introducing spaces before the '/' sign. Airtel person is right. The Wireless menu is missing. 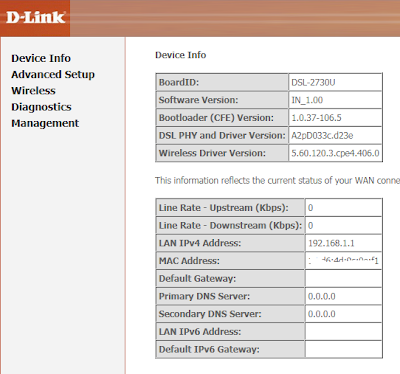 You should write to D-Link and ask them for a firmware update. ^ Can you please provide their email id where I have to contact them ? Thanks! Why do you say that wireless tab is missing. The attached image shows a wireless link on the left hand side menu, which you should click and configure your wireless password. This is mostly a problem with the access control page or mac filtering or not using the correct password. If you have not configured the password for wireless yet, lookup the manual or label below to find the defualt wireless password. If password is not the problem , check the page on mac filtering or parental control or like. I thing you should search on Net. My problem got solved, as I replaced it for another router, 2750u. Now it's been 4 months and again this D'link router started acting up.It keeps on restarting itself every 30min or so. It is really annoying and I cannot work on it. Please help, anyone. ? I am facing same problem with my Dlink DL-2730U i.e. sometimes my router not detected under Wireless Network Connection tab. I am using Firmware ver: IN_1.02. Members! Any solution to it?